The Schmalz Jumboflex vacuum tube lifter in action at the CeMAT materials handling expo in Melbourne. The Schmalz Jumboflex vacuum tube lifter is being used to reduce the heavy lifting that is required from workers in warehouses and factories in Australia. Capable of lifting items up to 35kg, the system can be used in unison with slewing cranes to move boxes, barrels, cans, sacks and buckets using vacuum suction. 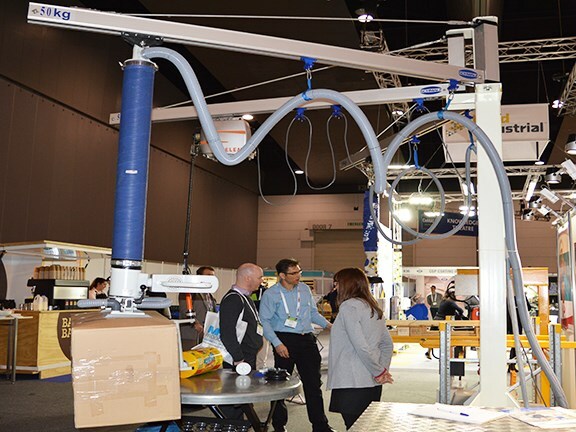 Heavy lifting is a major occupational health and safety issue in the plant and material handling industry, and Schmalz representatives showed how the Jumboflex system could be used to reduce the risk of staff injury with demonstrations at the CeMAT materials handling expo in Melbourne last week. Once the suction cup has a grip, you can move heavy items with one hand, allowing you to use a checklist, or apply stickers, or whatever else needs to be done with your free hand. A non-return valve prevents the load from being dropped or slipping even in the event of a power outage. The suction pads can be swivelled to 90 degrees to pick up loads from the side and you can choose between electrically operated or pneumatically operated, vacuum generators. The suction pads are easily replaceable when they get worn out and have a quick release function to make changing pads easy, depending on what you are lifting. For example, plastic sacks require a different type of pad than cardboard boxes. There is also a hook attachment that can be used instead of a suction cup, which comes in handy for lifting buckets and large cans. The Australian dealer for the Schmalz Jumboflex vacuum tube lifter is Millsom Materials Handling, which has outlets throughout the country. Is urban development choking our ports?